Using a PC case fan to aspirate your temperature/humidity probe. Dear WeatherCat weather station caregivers, . . . . I happened to be doing this under the the station's temperature/humidity probe and I could clearly hear the hum of the PC case fan I installed in early October. So it is still running well after close to 3 months. 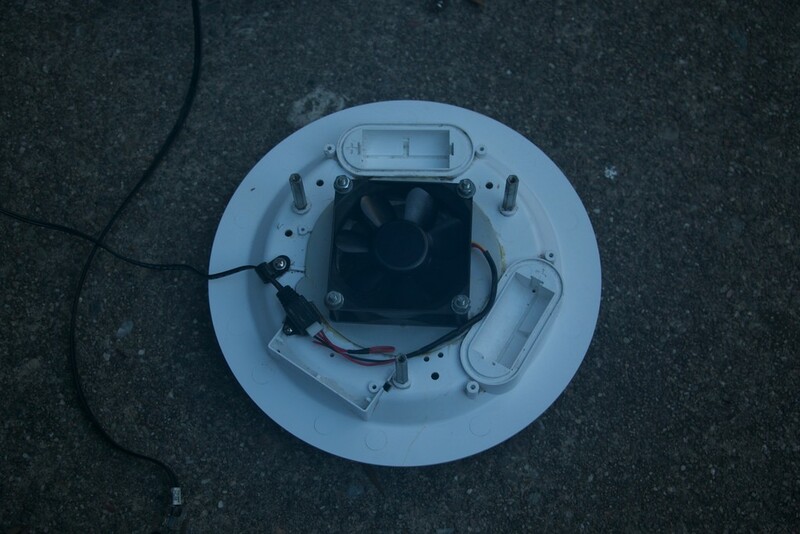 That still isn't a complete endurance test, but the original Davis fan was sounding very sick after less than a month. So this PC case fan is doing well considering it is winter and a few storms have already blown threw. We'll see how long this fan can last! P.S. Anyone who thinks that the mild California weather is delightful clearly didn't have to fight gophers in January! . 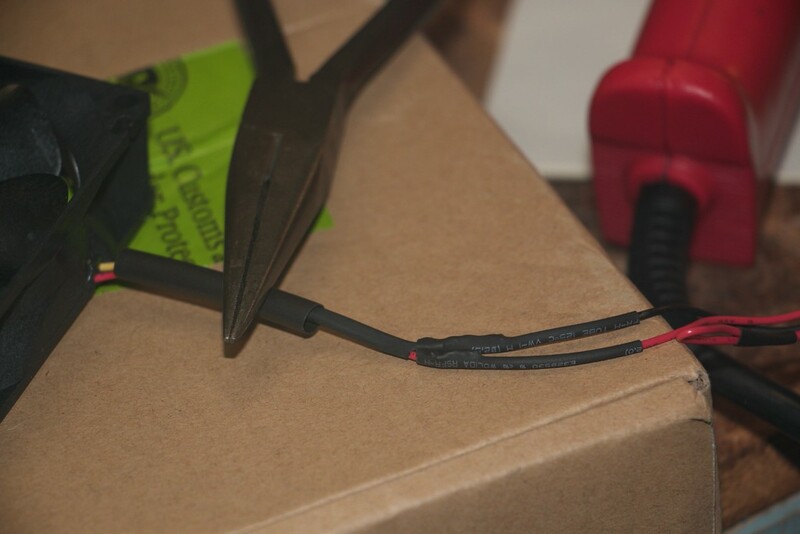 . .
Re: Using a PC case fan to aspirate your temperature/humidity probe. Maybe it's that "mild California weather" that is helping support Gophers! Even Minnesota has interweb service especially at the University. Are these "Golden" by any chance? Maybe it's that "mild California weather" that is helping support Gophers! I'm afraid you are correct on that one. Although the gophers do well in winter and then really pay the price in the summer-time when the soil dries out into something close to concrete. I usually only have gopher problems in the spring, but this year it is starting early. Even Minnesota has interweb service especially at the University. Are these "Golden" by any chance? Since I poison the darn critters without exposing their tunnels, I never do find out what color they are. However, honestly I couldn't care less what they look like other than dead! As a precaution I applied another round of poisoned bait this afternoon and once more was able to check up on the fan. I'm very pleased. It is so quiet that you can hardly hear it, but it continues to work very well! I find that leaving out the batteries for my hearing aids adds that effect at a much lower cost! I assume that you have actually observed that animals causing your problems. If not, it might be wise to determine if they are Gophers, Moles, Voles, Shrews, etc. Different species respond different treatments, these animals all have different EULAs! Be sure to contact their individual legal representatives, often called "Rodent Attorney Trade Support" (RATS). Santa left me a replacement fan from Rainman Weather. If this one bites the dust, I think I'll follow your lead. Dear Steve and WeatherCat station caregivers, . . . The Davis fans are indeed not a durable as they used to be. Either the PC case fan I installed is - or is not - still working! If and when that time comes, you'll know better what to do! The parts hardly look new, but the dust isn't even close to restricting the air flow. 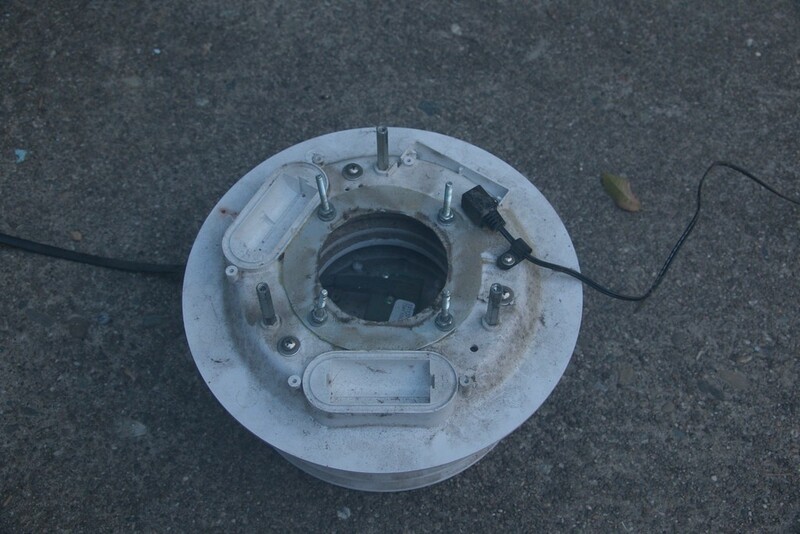 I removed the loose material with an air duster and reassembled everything. When I plugged the fan back it I could hear it's very quiet whisper. So at least one year into this experiment, it appears that PC case fans are indeed perfectly practical replacements to aspirate your temperature/humidity probe. 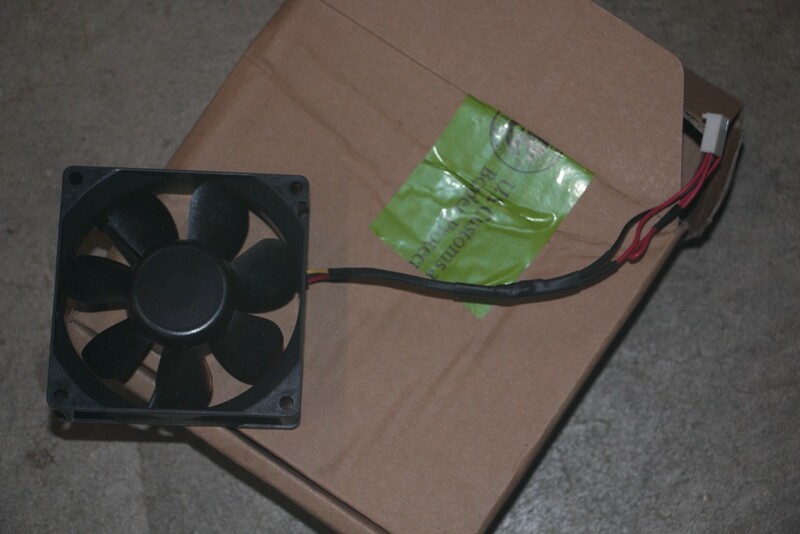 I wasn't willing to wait a month to replace this fan, so I paid for the economy FedEx international shipping. That was more than the fan, but hopefully I'll be able to get my station back to full operation sometime mid-month instead of waiting all the way to November. In the meantime, if anybody considers making this sort of upgrade definitely consider using an IP68 rated fan. It probably will save you some premature maintenance! More pictures please, of the new fan, and whether or not you have to make a new metal template, etc. 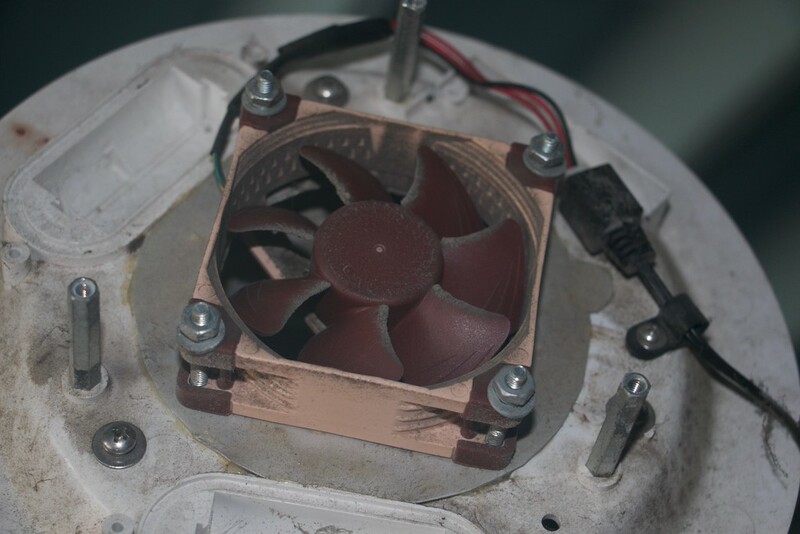 The new fan is also a 3" (80mm) case fan, so it should bolt right back into the position of the old fan without any additional modification. 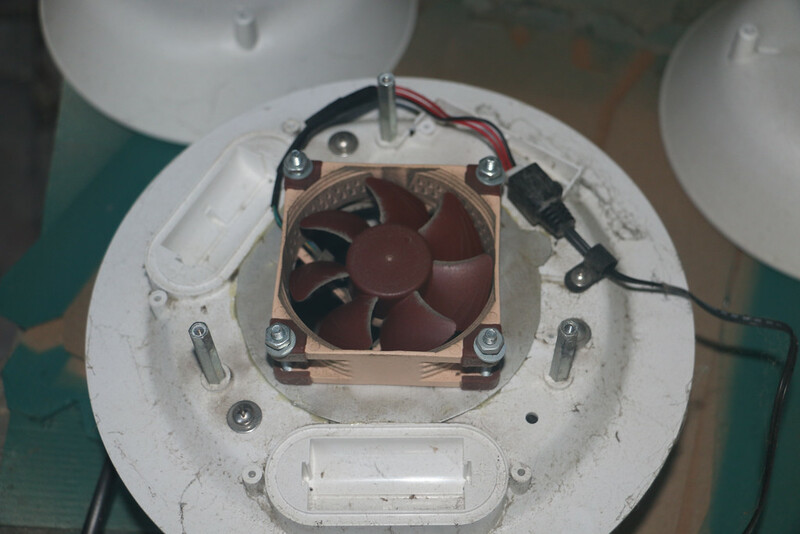 The one problem was concerned about was whether I should give myself a simpler connector to simplify replacing these fans if they were going die comparatively frequently. I'm going to hope this new fan can deliver the advertised life. So once more I'll soldier it directly to my power leads. Nonetheless, I'll have my camera handy to describe how the procedure unfolds. I avoided disconnecting the temperature/humidity probe when removing the dead fan, but I'll have to take apart the radiation shield to give it a thorough cleaning. So the station will be down for a while. Well it was a terrific struggle, but the new PC case fan is finally installed in my temperature/humidity enclosure. However, it took all the time I had to get it installed. So while I took pictures, if you are old enough to remember this: "breaking news at 6pm, film at 11!" Hopefully sometime tomorrow I'll have the time to download all the images and share with you all the gory details. . . . . . Sadly I must report that the vendor changed shipping companies with my order and it took another 4 days over what they promised. Nonetheless the product was indeed a 3" (80 mm) fan that would mount on the same plate that I had "fabbed" when installing the first fan. The first challenge was to figure out how to power the fan. 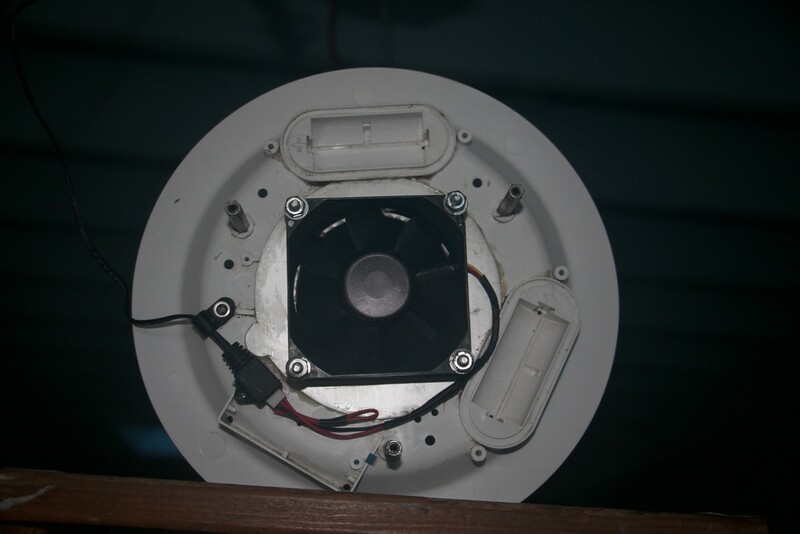 The previous fan could be powered by providing +12 volts to the yellow wire and connecting the ground to the black wire coming from the fan. The new fan stubbornly didn't work this way. By accident I discovered something shocking! 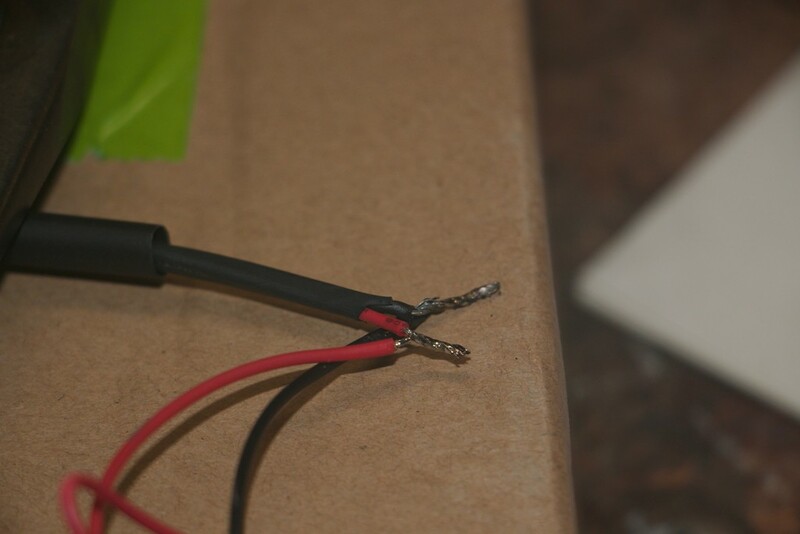 Connecting the +12 volts to the red wire and the ground to black worked perfectly! Of course that is how it should have been all along - which is why of course I didn't expect it! Every component needed some cleaning and while Simple Green degreaser did a good job of releasing the dust and grime, I'm still puzzled about what caused so much more debris to end up in the radiation shield this past year. It is difficult to see because the flash stopped the motion and there was very little background light to capture the motion during the exposure. Finally, I took this video with my iPhone so that you can hear the fan spinning. It is mostly quiet, you need to turn off other sounds to hear it, but it will give you some idea of what the fan sounds like. It is much louder than the old fan and would probably be annoying in a computer. However, for this application it is actually desirable. 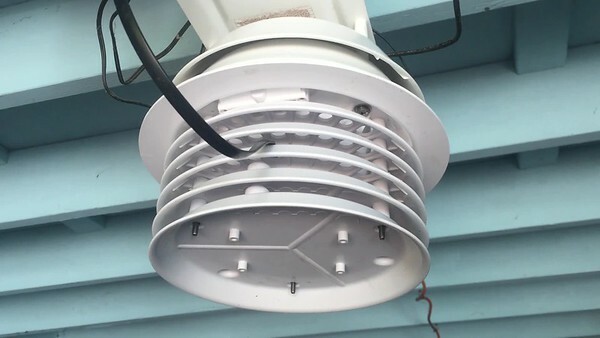 So long as there isn't any other background noises, the fan can be easily heard and that will serve to confirm that it continues to work properly. The mean life of this fan is something on the order of 7 years, so I'm hoping I won't have to do this again for a good long time! Thanks for the blow by blow description and photos. Glad you are back up and aspirating.